This past weekend marked the 39th anniversary of the passage of Pakistan’s second constitutional amendment, which defines the country’s Ahmadi community as non-Muslim. Ahmadis, a minority group who see themselves as an Islamic sect, revere their founder, Mirza Ghulam Ahmed, as a kind of prophet – a controversial view because he came after Muhammad, whom Sunni Muslims consider the final prophet. Sunnis form the majority of Pakistan’s population, and in recent years, there have been numerous incidents of violence against the Ahmadi community in Pakistan. In 2011, Pakistan earned the highest possible score on Pew Research Center’s social hostilities involving religion index. To mark the anniversary, several anti-Ahmadi organizations in Pakistan held conferences on Saturday night where speakers called for renewed efforts to isolate Ahmadis from public life, including banning them from working in government or military jobs. Ahmadi organizations such as Jamaat-i-Ahmadiyya advised their members to stay away from public places. 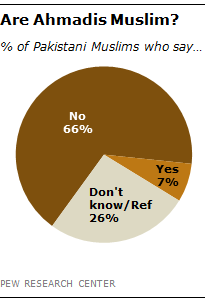 Two-in-three Pakistani Muslims say Ahmadis are not Muslims, according to a Pew Research poll conducted in November 2011. Just 7% accept Ahmadis as fellow Muslims, while 26% do not offer a response or say they don’t know. The poll also found that a majority of Pakistani Muslims support the country’s blasphemy laws, which predate Pakistan’s independence in 1947 but have since been expanded. The laws, which carry a potential death sentence for insulting Islam, have been frequently invoked against Ahmadis and other religious minorities in Pakistan; although formal criminal prosecutions are rare, social discrimination and harassment of Ahmadis is widespread. Fully 75% of Pakistani Muslims say blasphemy laws are necessary to protect Islam in their country, while 6% say blasphemy laws unfairly target minority communities, and 19% express no opinion on the issue.